OLD PARKED CARS. 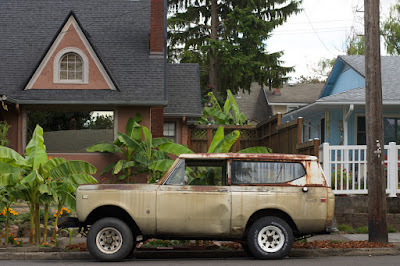 : 1975 International Harvester Scout II. 1975 International Harvester Scout II. Excellent texture in the detail shot. Great how the rust has stained the paint a richer colour. 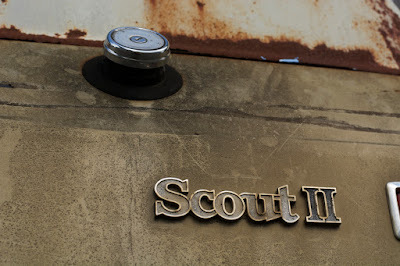 On a quiet night you can actually hear old Scouts rust. I've got one in the garage right now doing just that. Had a 75' in college and it was the same color as this one. God I miss it. Neat Scout. But what is UP with those trees?? 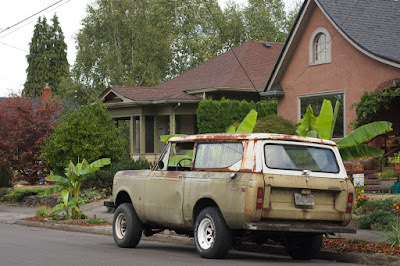 Seriously weird foliage and a cool truck, that's enough for a "best of" in my book. Cool truck. Beefy and primitive. 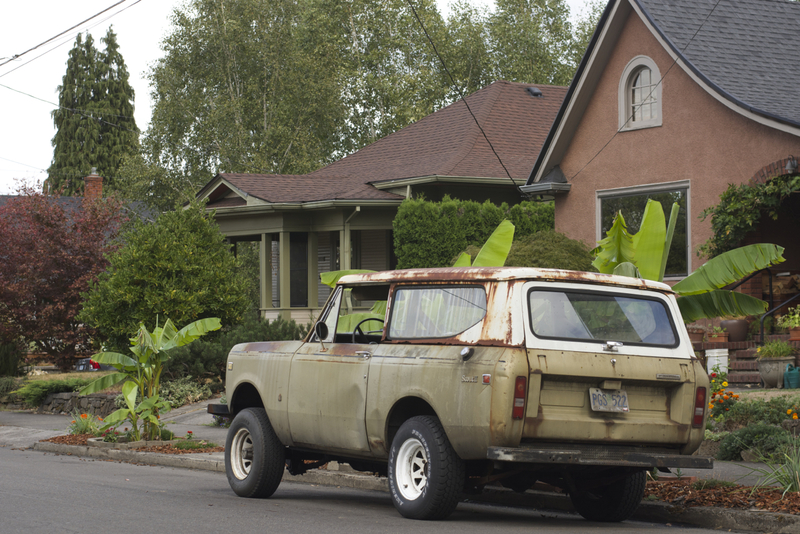 I've ridden in several that rusted around the base of the tailgate, leading tailpipe fumes right inside the car. Maybe why the window's rolled down on this one, too. This is the northwest. People who chop down native foliage to plant exotics make me want to puke. Move south already. 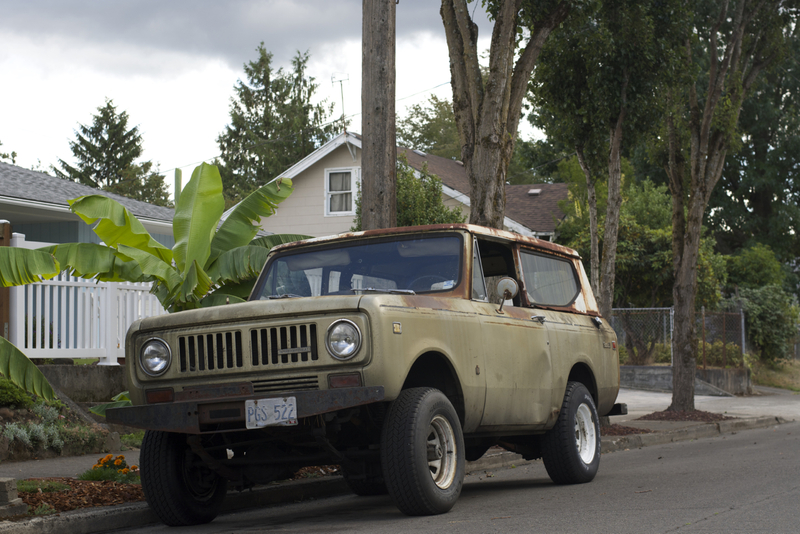 Reminds me of the Scout I used to own. Still my most beloved vehicle ever. The rear on mine was also riding low (due to leaf springs collapsing) so I fixed it by installing extended spring shackles. Normally these extended shackles would jack up the rear end but in my case they just put the read end level again! LOL! A cheap and easy fix! I had a '72 - baby puke mustard green... Scout's...were **heavy**. Getting the thing serviced "by the dealer" was always fun too, as you literally had to goto a Huge Diesel Truck location or a Farmer's Coop/Parts store. Way different than coffee, donuts and an over-eager Chevy dealer parts guy trying to sell you Xmas Tree Air Fresheners...indeed, parts guys' behind the IHC counter would likely try to sell you ½ of "Manure, steer" or a PTO attachment before they'd sell you anything girly like a Chevy guy. 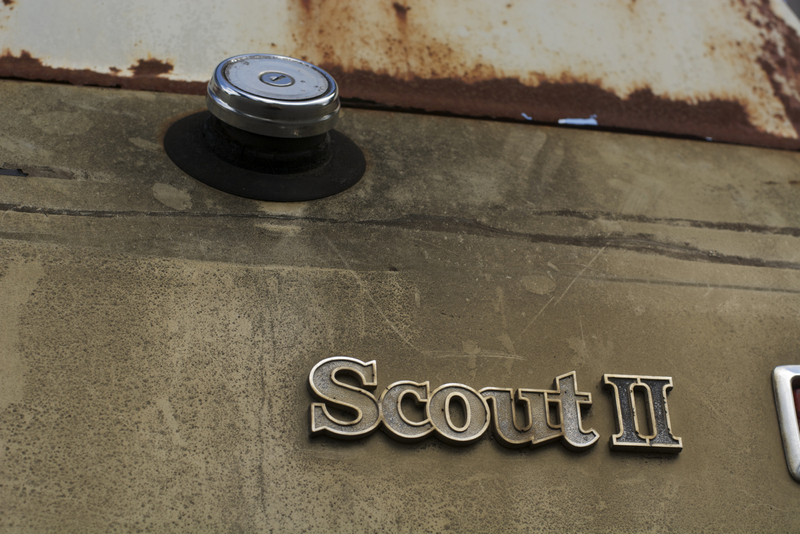 I miss my Scout...lost my virginity int he front seat...mine even had a 'THROTTLE LEVER !!!" Like a G_d-d*m-Train!